Having said that, I can’t claim to be an expert on any of the historical figures – are they heroes or war criminals? – who have inspired many Bike Odyssey cycling tours. However, thanks to a lucky break with that Hannibal history documentary that you’ve probably seen referenced all over our website, I can pretend to be an expert on one of them: Hannibal. The Hannibal cycle tour starts in Barcelona and ends in Rome and follows a big chunk of what we believe to be the actual Rome invasion route of the Carthaginian general – including his possible route over the Alps with his army and elephants. If you seek a thorough understanding of Hannibal and his war with Rome and enjoy the literary flourish of ancient authors (no really, Livy and Polybius are actually good reads), you should pick up copies of “The Rise of the Roman Empire” by the Greek historian and statesmen, Polybius, and also “The War with Hannibal” by the Roman author Livy. 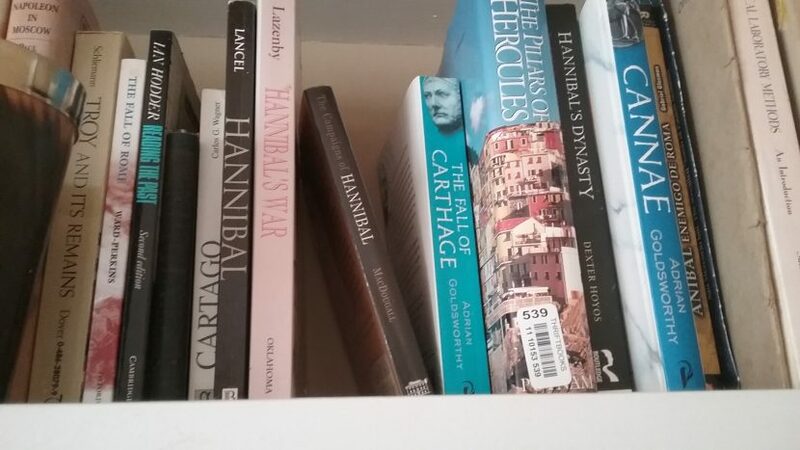 Both works were written after Hannibal’s exploits but are the closest thing we have to contemporary sources – of which there are none, unfortunately! Here’s a taste of Livy’s writing following the moment when Hannibal’s general Maharbal has tried and failed to convince Hannibal to attack Rome straight after his incredible victory at the Battle of Cannae: “Assuredly,” Maharbal replied, “no one man has been blessed with all God’s gifts. You know, Hannibal, how to win a fight; you do not know how to use your victory.” (Page 151 of the Penguin Classic version). Livy has a great sense of drama. Polybius is more methodical and journalistic and actually interviewed survivors of the war with Hannibal so his account is considered more accurate. Other excellent options for learning about Hannibal include, “Hannibal’s Dynasty” by Roman historian Dexter Hoyos. For a more philosophical approach to the topic and with an interesting analysis of archaeological evidence, French archaeologist Serge Lancel’s “Hannibal” is worth reading. For rollicking tales specifically about your cycle trail, Gavin de Beer’s “Hannibal’s March”, is one of a number of recent works that follow Hannibal’s invasion route. If you need a break from non-fiction, Ben Kane’s, “Hannibal Enemy of Rome” is an entertaining and atmospheric account of the Carthaginian’s impact on the known world through the experiences of the son of one of his commanders. (Full disclosure: Ben offered lots of enthusiasm and moral support when we were embarking on the “On Hannibal’s Trail” BBC documentary). On to reading material for Bike Odyssey’s Lionheart cycle tour! The cycling takes you from Venice to Paris via Italy, Austria, Germany and France. My reading list takes you from err, well, I’m not well versed in Richard the Lionheart. However, some quick scouting has led me to medieval history professor John Gillingham’s, “Richard the Lionheart”, which is described as well researched and very readable in some “customer” reviews. For more creative work, historical novelist Sharon Kay Penman’s “Lionheart: A Novel” gets quite a few accolades, especially for meticulous historical detail. I know Sam is currently reading a fictional work based on the times and exploits of Richard the Lionheart but focusing on another prominent figure: “Warlords: A Novel of Robin Hood” by Angus Donald. What did you think Sam? Finally, for the Che cycle tour, that takes you from Santiago, Chile to Bariloche in Argentina, you really should read the book that inspired this scenic pedalling escapade: “The Motorcycle Diaries” by Marxist revolutionary and Fidel Castro’s right-hand man, Ernesto “Che” Guevara. Guevara wrote this account of his journey when he was a medical student. Perhaps some Bike Odyssey cycle tour veterans can share some of their thoughts on the above reads and offer other reading suggestions?